Recently Watersedge posted a blog about managing anxiety. One of the techniques listed was drawing, or expressing what your anxiety looks like on paper. In our research we came across the artwork of Toby Allen, a young artist from the UK popular for his depiction of mental illness in his series ‘Real Monsters’. 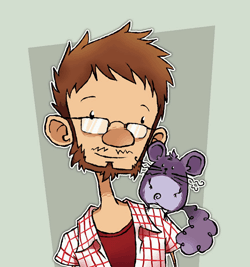 We hope you enjoy our interview with Toby as he reminds us of the power of creativity in managing our own anxiety. 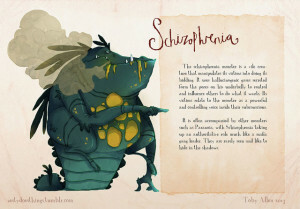 Why did you initially decide to draw mental illness and ‘monsters’ and how did this idea come about? The Real Monsters project originated from imagining my own anxieties as monsters and finding it to be a really therapeutic process to draw them. It made them feel weaker and I was able to look at my own anxiety in an almost comical way. I wanted to expand upon this idea and draw other representations of mental illnesses that could help people in the same way it helped me. I was hoping that the project would remind people struggling with their own ‘monsters’ that they are not alone and that some of these illnesses can be beaten or at least managed, as I think it is much easier to imagine containing or controlling something that is physical entity. I wanted people to laugh and smile when they see my work and feel a little less negative about themselves or their condition. What is the process you go through when designing a new ‘monster’? 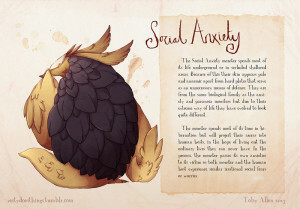 I began each monster design by researching the condition or disorder extensively, often relying on real life case studies or first person accounts of dealing with each disorder. I doodle throughout the researching process and try out many different ideas until I get something that works. The main focus throughout my research is to try and get a sense of what it’s like to live with these conditions and do away with all the stigma or preconceptions I may already aware of. When drawing, I will look up reference material of animals that share similar traits to the monster I want to create and use those influences to enhance the design. I then work digitally to create the final artwork, incorporating self made watercolour textures to add a whimsical touch. How does drawing assist you in coping with your own anxiety? The creative side of my life is hugely helpful in my day to day struggle with anxiety. Creating a piece of work based on my own anxiety in particular has helped me to view it in a different and more positive light. I have been able to turn something negative in my life into a positive and helpful piece of work that has managed to help people other than myself. When I am creating artwork I don’t feel anxious or worried about anything. I think about fantastical and amazing worlds filled with amazing characters that could only exist in my mind and in this world I can do anything or be anyone. I feel liberated from my anxiety and free from the pressures of the real world. It’s very much a form of escapism from the everyday worries and troubles. What has the public response been to your ‘Real Monsters’ series? Has this surprised you? I was completely taken aback by the public response to the work. It gained a hugely positive response from the Tumblr community in particular and the project went viral within a week of it being published on my blog. I have received so many meaningful messages from people who have one or many of the disorders I have drawn, each message telling me how much the work means to them and how it has helped them to think about their condition in a different or more positive way. I regularly receive heartfelt and sincere emails from people who wish to thank me for creating the work as if I created it especially for them. Reading articles about the project in national and global newspapers and websites was amazing and humbling. It is also very lovely to be recognised by mental health professionals via articles on their blogs or websites and reading praising emails from professionals within this field of work is hugely gratifying. Why do you think people relate to it so much? People seem to appreciate the artwork as well as the unique presentation and stories behind the monster characters. 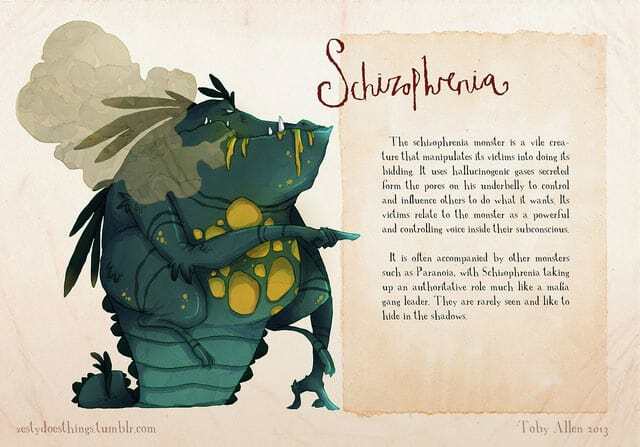 They can relate to the monsters and imagine their condition in a different way than they thought previous, sometimes making them laugh or simply feel a little bit better about their condition. Art is such a subjective medium and open to interpretation. I think I left the designs open enough for people to make sense of it themselves and therefore make each monster feel more personal to them. As someone who lives with anxiety, how would you suggest someone reading this can best support a loved one experiencing the same condition? I recommend talking, or rather, being a good listener. I always find that it helps me, to talk with someone about my worries or fears. I try talk to my parents about what is bothering me or getting me down, talk and joke with a good friend to lighten the mood or even have a heartfelt and honest chat with a pet. I really think that talking about your feelings to someone you trust is a great tool for when it all gets a bit too much or you can’t get something out of your mind. Don’t force someone to talk about it with you, just be there for them should they ‘fall’ and let them know that. Sometimes that can be enough to put their mind at ease. I would advise people with anxiety or another other condition, to try and do something every day that you really love and that makes you feel happy. Try to make time for yourself. When I am creating artwork I don’t feel anxious or worried about anything. I feel liberated from my anxiety and free from the pressures of the real world- even if just for an hour or two. Which ‘monster’ is your favourite and why? 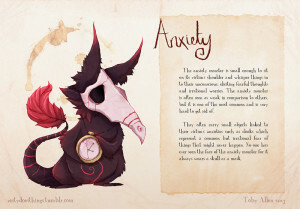 I think the anxiety monster is my favourite, as it is a very personal piece of work and reflects my own experience with anxiety well. It has a good mix of cute and creepy and the light and dark colour combination was very fun to play around with. I also really liked working on the depression monster. It’s so round and squishy (its design is based on a manatee, which is one of my favourite animals) and the waterfall like tail was particularly fun to draw. If you continue to struggle with feelings of anxiety, sadness, despair or thoughts of suicide, it is important that you seek professional health assistance as soon as possible to help you recover. Talking to your G.P. and/or a counsellor can give you the additional support you need to help you. If you would like to speak to Colleen for additional support, you can contact her on 0434 337 245 for a FREE 10 minute discussion or go to BOOK ONLINE NOW and follow the prompts to make an appointment. Images published with permission by Artist Toby Allen.